As the global oil inventory surplus narrows and the goal of the OPEC cuts is within reach, the oil cartel is mulling a change in the way it defines success, with an eye on keeping the current production limits in place at least through to the end of this year. Although there were a variety of reasons for oil prices rallying at the end of 2017 and hitting multiyear highs a month ago, the overarching reason was that the inventory overhang significantly narrowed, in large part because of the OPEC cuts. 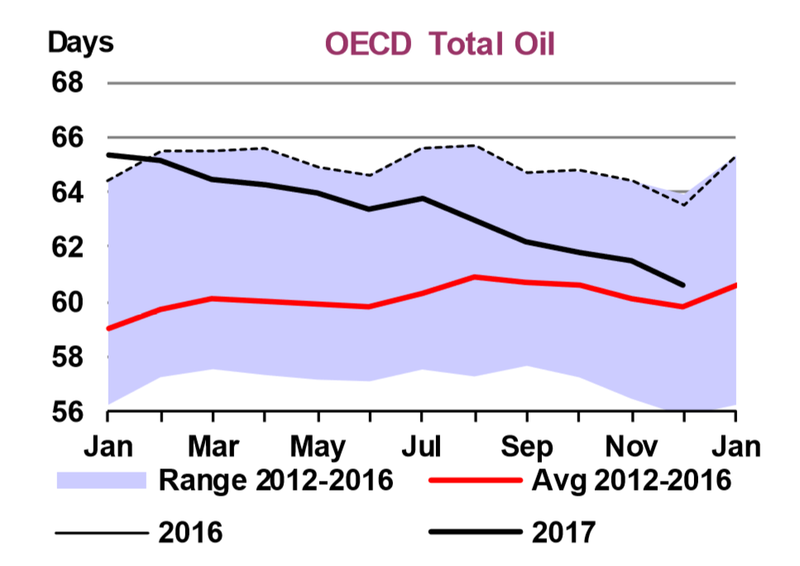 The IEA says that OECD inventories are now only 52 million barres above the five-year average, a surplus that has shrunk dramatically from 264 million barrels a year ago. “With the surplus having shrunk so dramatically, the success of the output agreement might be close to hand,” the IEA wrote in its February Oil Market Report. Other analysts have gone further. Citigroup and Goldman Sachs both estimate that the surplus has probably already been eliminated, meaning that the oil market has already reached the long-sought “balance” for which OPEC is aiming. But as success draws near, oil prices are still not where OPEC wants them. The group is considering changing the way it measures “balance” in the market, for several reasons. In other words, the five-year average inventory level is a moving target, and because it has been rising quite a bit, bringing global inventories down to that threshold is not as impressive as it would be if using an older five-year period. As a result, Saudi oil minister Khalid al-Falih suggested that OPEC would meet to discuss using a different metric. One option would be to use the “forward demand cover,” Bloomberg reports, or the number of days that the current stock of inventories could supply the global market. This would arguably be a more accurate measurement because it would incorporate the fact that demand has climbed significantly in recent years. That metric would probably work better as a barometer for oil market health, but as Bloomberg notes, by that measure, the oil market is still probably close to, or already at, the rebalancing point. The IEA said that as of December, OECD stocks were equivalent to 60.6 days’ worth of supply, which is back at the five-year average. OPEC will probably need a different metric if it wants to justify keeping the cuts in place. The problem for OPEC — and al-Falih admitted as much — is that the world is only going off of data from the OECD. There isn’t a ton of accurate or transparent data from much of the non-OECD. Citi incorporated several non-OECD nations into its estimate, including Saudi Arabia and Brazil, and it still concluded that inventories are back to the five-year average. Much of the motivation for al-Falih is to keep the Saudi Aramco IPO on track. But for that to occur, Saudi officials feel they need oil prices to be closer to $70 per barrel than $60. And, crucially, that price level of $70 needs to be in place in a year or two, not just today. In that sense, the Aramco IPO is, in a way, driving OPEC policy. But because oil futures for March 2019 are just above $60 per barrel — and 2020 futures are a few dollars lower — Saudi officials are pushing hard to keep the production limits in place for a while longer, hoping to drive up prices. “If you’re Mohammed Bin Salman, and trying to radically reinvent your country” then “you need a certain price to make it work,” said Helima Croft, head of commodity strategy at RBC Capital Markets LLC, according to Bloomberg. As a result, the OPEC cuts could remain in place, regardless of whether or not global inventories are back at the five-year average. Whether or not it is explicitly stated, Saudi officials could be pushing to keep the OPEC limits in place until futures prices rise to $70. I can only laugh! So if OPEC/Russia idling million of BPD of oil to diminish the Glut of oil on the market doesn't work well enough to push prices up, and having folks like Goldman Sachs, and Citibank, issues spurious reports that the Glut no longer exists and that prices will go as high as $82 doesn't work, than the answer is to fake the way you calculate the supply of oil sloshing around the market so it looks like there is no glut. What's funny is they openly talk about manipulating, not the glut, but the perception of the glut so openly. You'd think that would ruin their plan, but almost everybody that pays attention to the oil markets make more money if prices are higher, so they all just go along with anything that pushes prices higher. Right now there is no reason that oil should be above $40 a barrel, but WTI right now is at $62.59. That tells you all this manipulation to move prices higher works even when the reality is a glut of oil remains. Personally I hope the OPEC/Russia and the big banks, and the market all get their $70 a barrel oil. That will guarantee a continue Gold Rush in Shale Oil and Gas production in the USA where its illegal to play the games, although the entire industry certainly encourages it. The USA was forecasted to hit 11 million BPD sometime in 2019, and now with WTI $60 to $65 it will hit 11 Million BPD mid-2018. It will hit 12 Million early 2019, and 13 Million by the end of 2019. That's with WTI $60 to $65. If U.S. producers see prices moving to $70 and that OPEC/Russia can successfully manipulate prices there and keep them their my numbers for U.S. production may be low. $70 would be great for both U.S. production and for renewable energy. Cost of both will continue to go down as market share goes up, and U.S. economic growth likely can sustain $70 a barrel, and it will keep conservation efforts in place. So I hope Saudi Arabia is determined to push and keep oil at $70 or higher. While it is true that Saudi Arabia needs an oil price of $70 and higher for the success of its IPO of Saudi Aramco, it is my considered view that the Saudis are slowly but surely moving away from the IPO. Their own estimation is that the IPO will net them some $100 bn. But the recent anti-corruption drive has already netted them an estimated $106 bn according to Saudi official sources. Furthermore, eliminating the subsidies on water, electricity, gasoline and food will also save them some $100 bn and a peaceful settlement in Yemen would save them an estimated $72 bn being the current cost of their involvement there. Still with IPO or without IPO Saudi Arabia and other OPEC members would prefer an oil price far above $70 and given the positive oil fundamentals prevailing now, they will get it this year. I think they'll get it too. In the short term, it all boils down to who's figures do you believe? the IEA, EIA and API or OPEC's? In the long term, supply and demand will dictate the price and, with the recent rally in WTI, I know who I believe. And you know what, folks? They'll get it...the Saudis will have $70+/bbl on WTI as fast as Brent surged past $71/bbl due to algorithmic trading on behalf of hedge fund managers (aka "algos"). I have traded oil since 2008 (following its all-time high in July of '08) and with all of the technical analysis and fundamentals weighed in, it's OPEC that drives prices more than anything--and fast. It's as if the laws of supply and demand often do not exist when KSA speaks up (aka jawboning). The real question is, "What will OPEC do once WTI does cross the $70/bbl mark?" I doubt we will finally learn when and where this notorious sale of 5% of Aramco will have its IPO for KSA's infamous "Vision 2030" if this benchmark is reached in part due to a weak U.S. dollar. In fact, Dr. Salameh made an excellent observation I noticed weeks ago--that the MBS (the crown prince of Saudi Arabia) has already commandeered over $100 billion from other wealthy Saudi individuals, therefore, KSA doesn't need an IPO anyway. maybe they would like to have 2 goats per capita? Thus, barring an economic downturn, by early in the next decade the world economy will need but lack new oil production from longer-cycle conventional projects cancelled or delayed since the 2014 bust. Inventories will normalise amid wafer-thin spare production capacity (currently only about 2.5m b/d, or less than 3 per cent of world supply and likely to fall) that is dwarfed by the amount of oil supply at risk of geopolitical disruption (about 4.5m b/d currently). Prices will rise sharply, likely returning to the triple digits, to restrain consumption and reflect a varying risk premium. I would also add that US shale oil production is heavily weighted toward the light end, condensate and NGL, with minimal distillate content. Globally, it's very likely that actual global crude oil production (45 API gravity and lower crude oil) has been on an "Undulating plateau" since 2005, while global natural gas production and associated liquids, condensate and NGL, have (so far) continued to increase. There exists a group of people, and they don't work in the oil and gas industry, who think the production of oil is as simple as turning on a faucet or a printing press and it results in thinking such as this: "The USA was forecasted to hit 11 million BPD sometime in 2019, and now with WTI $60 to $65 it will hit 11 Million BPD mid-2018. It will hit 12 Million early 2019, and 13 Million by the end of 2019." Such figures would require, first, oil prices well beyond $100/b to incentivize such an effort, but secondly, a much, much larger work and equipment force to accomplish it. The bust of 2014-15 drove off many of the younger workers whom the industry really needed to "stay in the game" in order to become the leaders of the industry in the not too distant future. They're gone and most have said they're not coming back due to the cyclical nature of the business. The equipment is there but there isn't anyone to run it. Shale will have diminishing returns going forward as the marginal price of production increases due to rising interest rates, less risk capital, and lower yield projects. But what will cause an oil spike over $100 in the nxt couple of years will be increasing demand in India and China, and the dearth of new deep well projects since the last oil bust in early 2016. Sure, OPEC can manipulate oil price by lowering output and decreasing short-term inventory because oil price is very inelastic, but the main driver of increasing oil prices is already in place, a lag in conventional E&P.